For many years, Sarah Morris’ artistic output has included beautifully-composed and exquisitely-rendered abstract paintings, as well as meditative, thought-provoking films, many of which explore the role of cinema. Some of her recent works combine these interests as the artist paints geometric compositions on vintage movie posters. 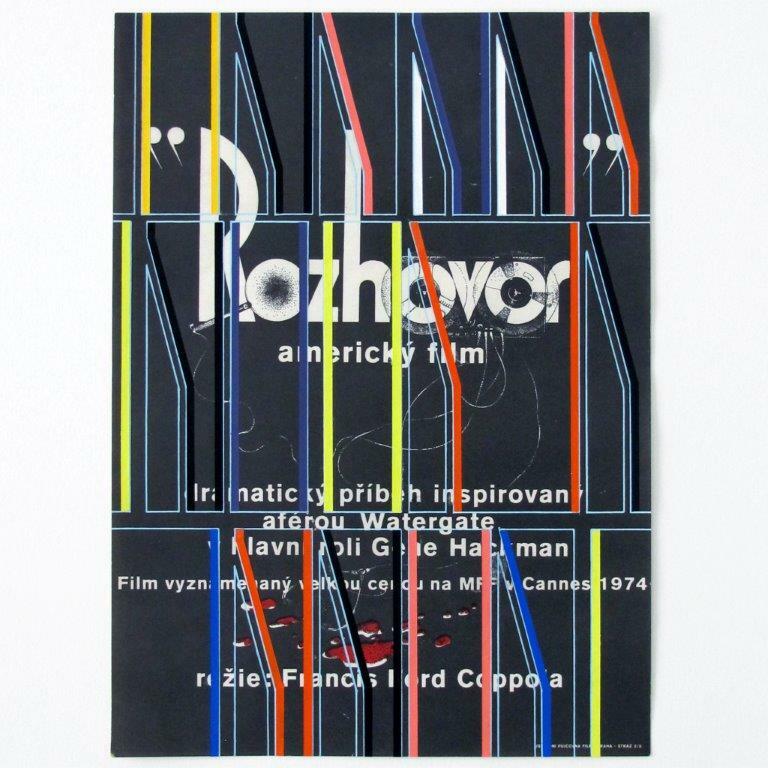 In this work, the background is a Czech poster for Francis Ford Coppola’s 1974 film The Conversation (which starred Gene Hackman). Typical of her large-scale paintings, her color choice and formal geometry possess a superbly-calibrated rhythm and depth that seem to reference the poster’s font, while also suggesting an architectural structure. Morris lives and works in New York and London. She received the Joan Mitchell Foundation Painting Award in 2001, and in 1999-2000 was an American Academy Award, Berlin Prize Fellow. Morris has had two extensive solo exhibitions in Europe at the Museum für Moderne Kunst, Frankfurt, and Museo d’Arte Moderna, Bologna, where they co-produced the publication “Beijing” along with Witte de With, Rotterdam. Her work has been exhibited in numerous international exhibitions, with solo exhibitions including Fondation Beyeler, Riehen/Basel; the Museum Boijmans van Beuningen, Rotterdam; Moderna Museet, Stockholm; Palais de Tokyo, Paris; Kestner Gesellschaft, Hannover; Kunstforeningen, Copenhagen; Miami MOCA; Hirshhorn Museum, Washington D.C.; and Nationalgalerie im Hamburger Bahnhof, Berlin.